Winter solstice is approaching fast, my diary notifies me, on the 21st December. The shortest day of the year and the fewest hours of light. “Oh, that’s great!” is my first thought. Sunlight is coming back! And then, my not very mindfulness-friendly afterthoughts come like an avalanche. Reflection One: In my little world of diary entries, notes and to-do lists, the notification of the winter solstice day has always carried a sense of relief and a breath of fresh air (admittedly often arctic). Although knowing that the coldest days of winter are yet to come, at least there will be more and more daylight. What’s not to love! Reflection Two (with a slightly embarrassed undertone to it): As per usual then, I will proceed with working, planning and getting on with life, and miss that day altogether (as is usually the case). Reflection Three: The Cons. Am I really too busy? (It is the run up to Christmas). Or maybe there is nothing deeper to contemplate? Let me think again. Wouldn’t it be just really, really nice to sit down in silence? To just be? Wouldn’t it be heart warming to welcome a change, to acknowledge that the days are about to become longer and nights a little shorter each day? Wouldn’t it be comforting to light a fire, or a candle, or several of them and appreciate for a moment what can be gained from being surrounded by friendly, cosy, warm darkness? This moment of contemplation on the day of the solstice when the “sun stands still”, is a good time to hear and feel what you want your life to look like. If you knew you couldn’t fail, what would you do or be doing now that you are not? What is important to you? What is standing in your way? Where would you like to go? This is the time to grab your imaginary post-it (or whatever works for you) and write what your heart’s desire is and let that thought, that intention settle. Just like we practice meditation to harness the wandering mind, this time do the opposite, allow your mind to wander in a field of endless possibilities. 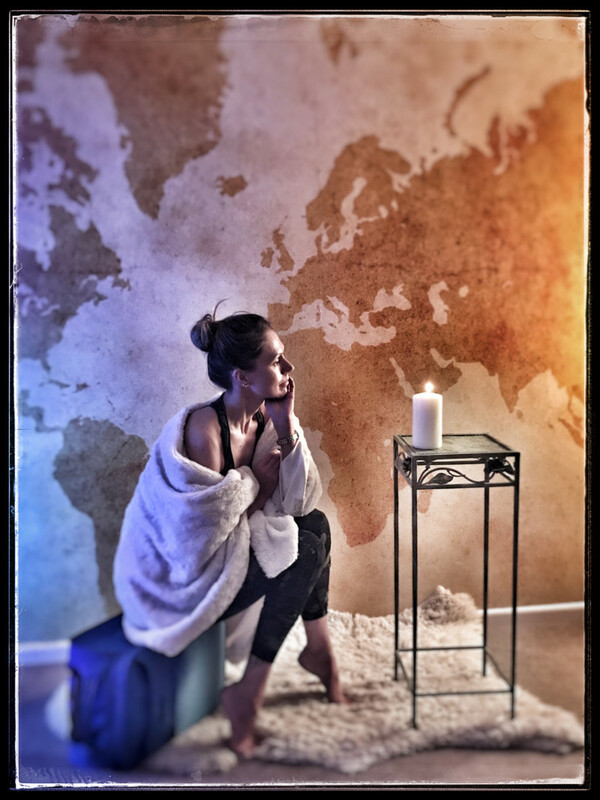 Lighting a fire or a candle can be your own, personal little ceremony that offers you a space where you can dive deeply and enquire what can be let go of, what is welcome and to open up to the change within, however big, however small. This is also an opportunity to try a traditional yogic cleansing practice known as “blinkless gazing” or tratak. Just concentrating on the glow of the flame and holding your gaze without blinking for as long as possible can be not only beneficial in terms of focus, concentration, greater memory and alertness but also traditionally it is said that this practise develops the faculties of greater intuition and that the past, present and future all begin to appear with equal clarity. Tears? This is the cleansing part of the process. When the tears begin to flow, just close your eyes, hold the image of the flame underneath your closed eyelids and see what else that warm, cosy darkness brings as an offering. Breathe deeply as the image of light dissolves away. Repeat once more. Finally, with your eyes open, just state your intentions one last time. Then silently thank the day, the gifts you have received and welcome the light. Returning now to cooking, working, wrapping, planning and getting on with the to-do lists, post-its and the end-of-year whirlwind, will hopefully feel a lot lighter now, perhaps easier, knowing that the days are getting longer. Also, we’re soon adding a full two minutes each day to the daylight hours, just long enough to squeeze in an “emergency meditation”?! Epilepsy, eyestrain, astigmatism or early symptoms of cataract, use a black dot instead of a candle flame. Glaucoma, do not practice tratak.